[PDF] The Handbook of Child and Adolescent Clinical Psychology: A Contextual Approach | Free eBooks Download - EBOOKEE! 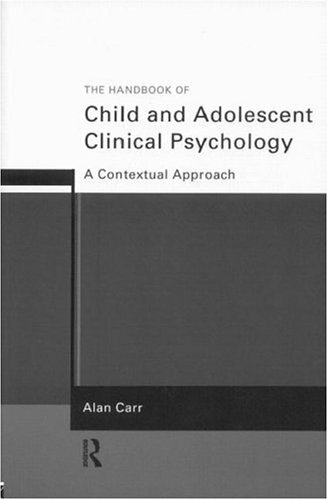 Description: Alan Carr provides a comprehensive, thorough and practical guide to modern child and adolescent psychology. The Handbook of Child and Adolescent Clinical Psychology covers all central concerns for practitioners in a single manual, including: conduct problems, emotional problems, learning disabilities, child protection, somatic illness, major depression, suicide, drug abuse, schizophrenia, divorce, foster care and bereavement. It will be essential reading for child and adolescent clinical psychologists, and valuable to many professionals in training, including educational psychologists, counselling psychologists, health psychologists, child psychotherapists, family therapists, psychiatrists, psychiatric nurses, counsellors and child care workers. No comments for "[PDF] The Handbook of Child and Adolescent Clinical Psychology: A Contextual Approach".